14:21 new york sports clubs are opening their doors to locals (18 and over with ID) in need of a shower, electricity, or a workout. the southernmost manhattan locations currently in operation are at 41st street. 14:00 the transportation situation is expected to improve this afternoon (as metro north and the long island railroad are restored) and tomorrow (when parts of the subway will come back up, above 34th street, at least). this is good news, but i'm still inexplicably furious at the new york city marathon (still on for this sunday), which i have decided to blame for the uneven distribution of city services. [new york times sports reporter mary] Pilon said the downside of canceling the marathon not only includes an economic impact for the hundreds of companies involving in putting on the event, but also for the many runners who have trained for months. "There's a lot of emotion tied to this event," she said. there is indeed; i, for example, think of the nypd escorting athletes instead of directing traffic after dark on the lower east side or figuring out if elderly nycha residents are stranded in their high rises and i feel like starting a bar fight. 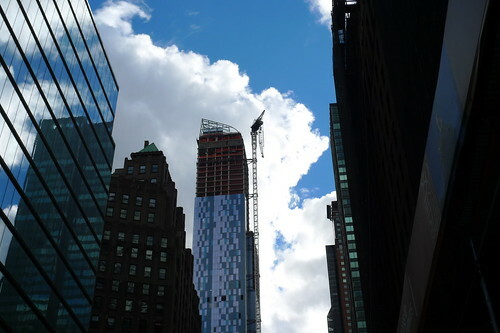 11:57 the crane at one57 continues to dangle, and the blocks surrounding it are shut down as far as eighth avenue to the west. a bus is parked diagonally across 57th street to prevent traffic from continuing east. 10:35 central park east is the new 4/5/6 train; the sidewalks were packed with commuters in business suits and old sneakers. i thought at first that the park's magnificent old trees had fared better than the ones surrounding our apartment complex on grand street, but they've simply been cleared more quickly. chainsawed trunks litter the grounds north of columbus circle. 09:05 "i love you," says joe. "don't walk under any trees." i'm taking the 40 blocks to my midtown office on foot, which is actually quite reasonable; we've walked manhattan top to bottom several times, and i dislike buses under the best of circumstances. today they're free and the only public transportation in town. 22:41 there was, i will concede, a bit of post-storm weepiness this afternoon; call it two parts "will the windows explode?" sleep deprivation, one part leaving the cats alone in our apartment for the next day or two (we migrated north to my dad and stepmother's place on the upper east side, as we aren't expected to regain power for a few more days), and one part gouging my head on a cabinet as the sun set and our kitchen darkened. passing between 38th and 39th street on our way up first avenue felt like crossing into oz from kansas: a sudden riot of lights and commerce, the promise of the grid replacing the horrid possibility of hitting a pedestrian in the gloaming (pedestrians in the dark zone of lower manhattan, please wear reflective gear). 19:09 a gal with a duffel bag watches me hit the button for the 35th floor. "boy, YOU'RE glad the power stayed on up here." "yeah i am," i reply. "we live on the lower east side; this isn't our place." "i'm downtown too," she says. upper east side expat fist bump. 10:48 power remains out, / though matches will light the stove. / showering's the rub. 22:25 wind's still indignant, / but the moon let the tide go. / we've got this, new york. 21:05 unsurprisingly, / i'm alone in fondness for / compulsory night. 20:42 and the power's out. stay safe, team; expect update haiku for a bit. 20:25 the lights are flickering regularly now. it's like a séance. at a municipal airport. 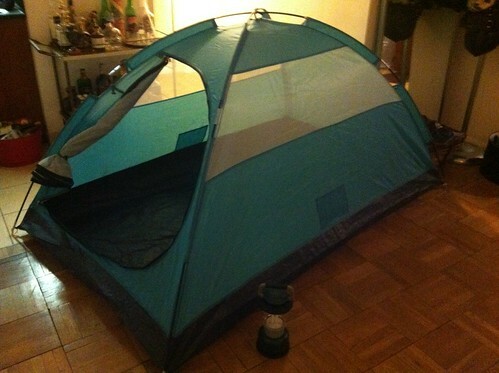 19:54 the east river has climbed over its bank across the street, we're expecting to lose power in the next 15 minutes or so, and the wind is picking up again; alors, it's time for the magic of apartment tent. 19:21 the beige sea foam erupting from jamaica bay is, if anything, even more frightening after dark; abc's on-scene reporter appears to be having a slap-fight with a root beer float. it could be time for me to rethink my leisurely swims at rockaway beach. 19:02 the weather channel is reporting gusts of up to 64 mph in new york city, and i believe it; joe claims he heard a window pop on a building next door, though i think it was just a beleaguered air conditioner. it's loud, is my point. 18:17 as of half an hour ago, the east river is over the sea wall down at the south street seaport near pier 11; battery park is underwater. 17:50 in re eating habits forced upon us by sandy, we're somewhere between 'csa survivalism' (i baked bread and roasted a bunch of beets last night) and 'snack opportunism' (my college roommate texted this morning, concerned that we might not have enough candy on hand; i assured her we made it to cvs last night for screme eggs and sour patch kids.) this is not our first rodeo. 17:35 our friends in jersey still have power, which is actually kind of shocking; they went without for something like three days last summer. chris christie is now telling the rest of the state to save their own asses tonight. he is the angriest man on television. 16:02 because i am twelve, i spent the first part of governor cuomo's press conference wondering how first girlfriend sandra lee is preparing for the storm. predictably, she tweeted a cocktail recipe (and, to be fair, disaster-preparedness tips). 15:48 reuters backs our neighbor up; it sounds like we could lose power around eight tonight (that is, high tide). "Blackouts could affect streets as far north as 34th Street, in line with the Empire State building, a Con Edison spokesman said, though would likely be limited to those avenues closest to the East and Hudson rivers." 15:31 saxelby, our neighborhood cheesemonger, is keeping us abreast of the culinary situation on the ground via twitter and facebook (a cheese evacuation in red hook relocated their stock to brooklyn soda works three hours ago; pickle day is rescheduled for this sunday, and so on). september wines & spirits, in turn, wishes us well with gene wilder, as one does. 15:15 a neighbor i don't recognize materializes at the front door and tells us con ed is thinking of cutting the power; we should fill our tub with water. we do, and make a huge batch of popcorn for good measure. mostly unrelated, since tub-water is for flushing the toilet: when we lived in our horrible tenement apartment in hell's kitchen, the water in the bathroom was ice-cold and tasted fantastic. 14:50 my friend lisa checks in from washington, dc: "not even 12 hours in and people are already going stir-crazy." the wind through the bridge is now a banshee's moan. 14:01 in brooklyn, in turn, our friend dan files a report: "Streets are empty but barely any rain and only moderate wind. More importantly, it seems that roughly 20% of restaurants are open, but 80% of bars are." here in manhattan, there's still a decent flow of pedestrian traffic on the williamsburg bridge. 13:34 the first round of "is-everybody-okay?" group emails is scrolling into my gmail account. "My bathtub is full of water like they said to do," our friend tony reports from wall street, "but i dont know why. It tastes so bad." 13:21 pcmag.com reports that the new york times, the wall street journal, and the boston globe are all dropping their paywalls for storm coverage, though the globe's site doesn't seem to have caught up with the announcement yet. joe is home, thank goodness; the fdr is already closed uptown, and we're expecting closure down here soon. the times's midtown webcam is similar to the view from the lower east side, for now. 12:40 big hiccups in our internet access (i'm making this update with my iphone); it's going to be a long day. i balloothanized justin bieber, who was hovering around listlessly at eye level, and steve refuses to look at me. 11:51 the citywide reaction to bloomberg's most recent press conference has been resounding: everyone is captivated by his expressive sign-language interpreter. 11:31 governor cuomo announced that the battery park and holland tunnels will close at two. joe is on his way back from work now; the wind is comparatively tame for the moment, but i made him promise he wouldn't take a bridge. 10:18 the gym is once again packed to the gills, which makes sense, i suppose; since we're all indoors, why not? most of us are indoors, that is; i circled our building after my run and met a guy en route to the mailbox with a netflix envelope(?). we clucked at the downed branches and wicked potential projectiles scattered about the back garden. 08:55 @JitneyGuy (in atlantic city): "80 feet of boardwalk floating free at Atlantic and New Hampshire Ave."
08:32 gothamist posted the mta's grand central terminal photos; the halls are empty and gleaming. they're reporting that this is only the second time in history that subway, train, and commuter rail service has been suspended all at once (irene was the first). 07:28 woke up to whitecaps on the east river; fdr heading south is nearly deserted, and the northbound side is full of emergency vehicles. joe is leaving for work soon. 23:01 per an update at nymag.com, the gowanus canal started flooding an hour and a half ago (a senior editor for the new york observer lives in the neighborhood and has been tweeting updates). ew. 20:49 nasdaq reports that all new york city and long island starbucks locations will be closed tomorrow. now everyone really does have to stay home: there's nowhere to pee. 20:18 we've got most of the windows open - we figure we'll have to shut them up soon and want to ventilate the apartment for as long as we can - and the wind has sent steve's mylar justin bieber balloon whirling around the apartment. this does not please him; he's now on our bed in loaf position, his tail wrapped tightly around the balloon's long purple ribbon. Due to Hurricane Sandy, we will be closing our spas starting Sunday at 3:00pm and continuing all day Monday. We will be monitoring the weather closely to send you updates as the storm develops. We apologize for any inconvenience this may cause. Please stay safe during the storm. 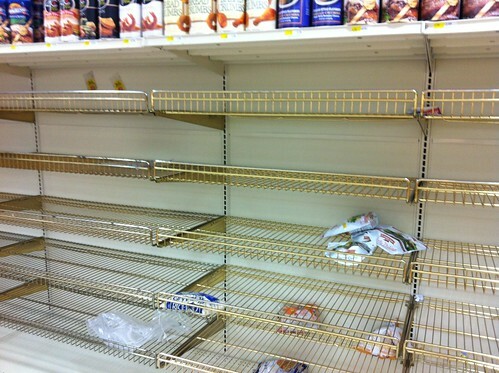 18:06 plenty of water at the grocery store, though our neighbors appear to have stockpiled...diet root beer? storm-related carb loading is in full swing; bread, she is long gone. 16:35 welcome to hurricane bloggin' II: electric boogaloo (previous episode here). once again, we're going to stay in the apartment; it looks i'll be working from home tomorrow, since the subways are going down as of seven this evening. at present joe is still expected at his office out in queens.